New Book by Mission San Jose Dominican Sister Donna Maria Moses, O.P. American Catholic Women Religious: Radicalized by Mission, a new book by Mission San Jose Dominican Sister Donna Maria Moses, is now available. 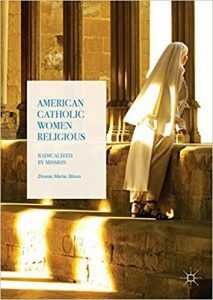 The book depicts the significant role played by American Catholic Women Religious in the broader narratives of modern American history and the history of the Catholic Church. The book is a guide to fifty foreign missions founded by Dominican and Maryknoll Sisters in the twentieth century. Sister Donna Moses examines root causes for the radical political stances taken by American Catholic Women Religious in the latter half of the century and for the conservative backlash that followed. The book identifies key events that contributed to the present state of division within the American Catholic Church and describes current efforts to engage in dynamic dialogue. The book is available at Springer International Publishing (electronic copy) and on Amazon.